A brief history lesson, with stories and photos. The island of Corsica is located in the Mediterranean sea just west of Italy and south of France, and, as such, has long been desired by neighboring lands as a strategic military and trading base. The Greeks were there, the Romans were there, the Vandals and Visigoths and even Pepin the Short (third Carolingian king of the Frankish realm!) were there! For five centuries (1347 - 1729) it was held by the Republic of Genoa, a small Catholic nation based on the southern coast of what is now Italy. 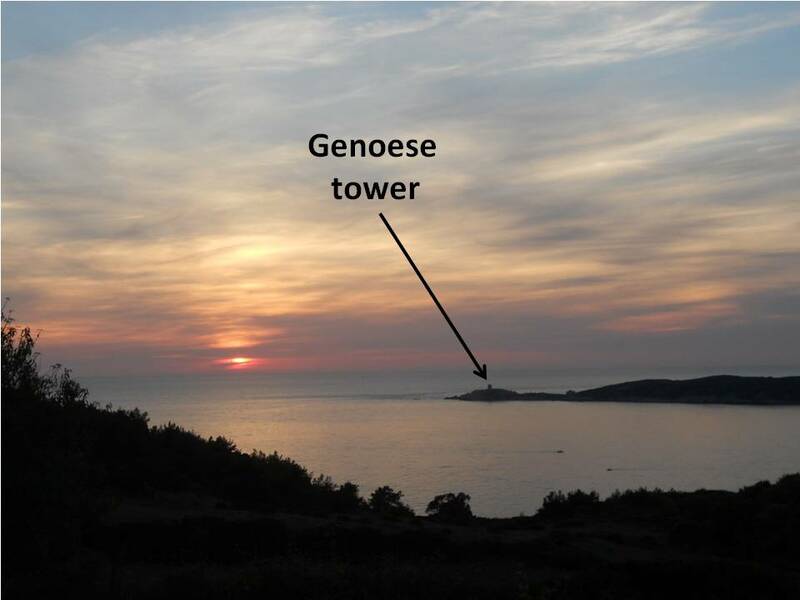 During the time of the Genoese Empire, three watchtowers were built in the vicinity of what is now Cargese, where I was staying during the conference. On our day off from lectures, Pablo (a friend I met at the conference) and I hiked out to one of the towers. It was about an hour and a half long walk from the village, along a fairly well tread trail through the scrub - though I must point out that all trails in Corsica, no matter how well tread, feature little miniature lizards that scurry out of your path as you walk, like the grasshoppers that fly up before your feet in the prairie, or pigeons that alight in advance of you in the city. I found them hopelessly adorable, and tried many times in vain to catch a picture. The tower, now much closer. From the top! We played charades with a nice French couple to get the photo taken. Inside the tower. Pablo objects to stairways. Captain Morganing it with history! This post is getting quite long, so please bear with me through one more historical story. During the nineteenth century, Greeks started to migrate to Corsica to escape the Ottoman Turkish rule, and so, when the town of Cargese was founded, it was necessary to build two churches in the town, one Greek Orthodox and the other Catholic. They were both small but breathtaking, and it was fun to compare the two styles. After two weeks with mostly boys, I found Joan of Arc very inspiring. You made it! Take care!